Note: This is the first in a three-part series about Qualcomm Institute research projects that have a direct impact on aging. All three projects are funded through the Calit2 Strategic Research Opportunities program. The Qualcomm Institute is the University of California, San Diego division of the California Institute for Telecommunications and Information Technology (Calit2). Experts agree that the ability to navigate a neighborhood or built space is one of the first faculties to suffer at the onset of cognitive decline. They also agree that early intervention is crucial for stemming the further ravages of dementia. But catching adults ‘in the act’ of getting lost or disoriented is a challenging and expensive research problem — one that a new low-cost, virtual-reality based tool being developed at the University of California, San Diego’s Qualcomm Institute hopes to address. The VE-HuNT System (Virtual Environment Human Navigation Task) is a research endeavor of UC San Diego Biological Sciences Professor Eduardo Macagno. 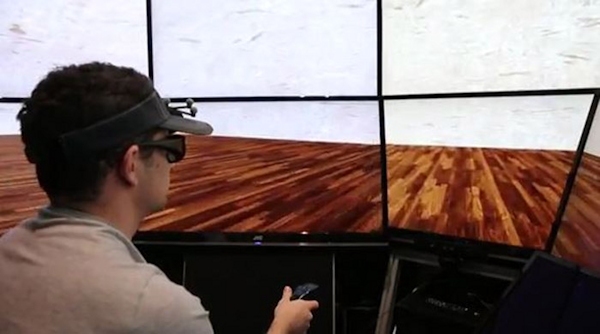 It’s a combination of hardware and software that will immerse test subjects in a human-scale, interactive, virtual-reality-based ‘room.’ Users use a computer interface device akin to a steering wheel and gas pedal to navigate the room, which is created in 3D in a portable, office-sized version of the Qualcomm Institute’s NexCAVE or StarCAVE environments. The subjects are asked to perform a series of increasingly difficult navigational tasks, such as finding a colored tile on the floor with and without navigational cues. “The idea is to give an older person a series of tests and see where they fail,” says Macagno. “We record how long it takes them, which paths they take.” Macagno says a steering wheel was selected over a remote control for the task because aging users are more likely to have familiarity with the former over the latter. Macagno has spent several years working with Qualcomm Institute Assistant Research Scientist Jürgen Schulze and QI Director of Visualization Thomas DeFanti — with funding from San Diego-based HMC Architects — to design virtual built environments for various research endeavors at the intersection of architecture, neuroscience and cognitive science. Professor of Neurology and Neuroscience Michael Rafii and Professor of Psychiatry Dilip Jeste of the UC San Diego Center for Research and Aging are also collaborators on the clinical expansion of that research. “Especially in health care,” notes Macagno, “there are many applications of virtual-reality technology which have not yet been implemented in medical professionals’ workflows.” He adds that current diagnostic tools, such as volumetric MRI or PET scans, are very expensive and would not be feasible for assessing all patients in their 50s (or younger) when a diagnosis of risk would be most useful. The VE-HuNT system as conceived is made with off-the-shelf consumer components and is compact enough to be housed in any neurology or clinical facility and used as a quantitative assessment of patients along with other cognitive tests. The first trial of the VE-HuNT System is currently in the planning stages and will involve 20-30 adults in varying stages of cognitive decline and a corresponding number of control subjects. Several software packages built from QI’s custom CAVE-CAD software will be developed for the trials, as will an algorithm derived from electro-oculography (EOG) data recorded synchronously in the StarCAVE. The algorithm is designed to track a user’s visual attention of moving objects and can provide quantitative and reproducible measures of visuospatial abilities. Subjects undergoing specific treatments for cognitive impairment can be compared to controls to determine the most effective interventions.